Today, the Vale of Glamorgan League clubs can compete for the Barry Cup, the ASRS Cup, the Dockers Cup, and the Supporters’ Cup. There are also several youth cups. The oldest cup, and competition, in the district is the ASRS Cup. The ASRS Cup also has the distinction of being the first Cup Final played at Jenner Park in April 1914, won, appropriately enough, by the home club’s ‘A’ team. The ‘A’ team would later become the equivalent of Barry’s Welsh League side, but more on that at some later date. The Barry Cup, Dockers’ Cup, Youth Cup, and Supporters’ Cup all came after the ASRS Cup competition. With the establishment of the Barry & District Association Football League in time for the 1920-21 there was a great surge of interest in local football. Local tradesman paid for the Barry Cup and medals initially, and then came the Barry Dockers’ Cup soon after. The Youth Cup has its origins as the Harris Cup, but the present Youth Cup dates from the 1960s and was known as the Billy Butlin Cup due to the opening of the holiday resort on Barry Island. The Supporters’ Cup, or to give it it’s full title, the Barry Town Supporters’ Cup was donated to the Barry & District League by the Barry Town Supporters’ Club after the Second World War when both Barry Town and the local league were beginning to re-emerge. The ASRS Cup is a terrific time capsule of Barry history. The ASRS stood for the Amalgamated Society of Railway Servants, and was one of the first, if not the first, trade union. Begun in the 1870s, the first branch of the ASRS opened in Barry in 1889 on the completion and opening of No.1. Dock. This first Barry branch soon took in four other local branches, such as Cadoxton and Hafod, and with over 500 paying members soon became the biggest single branch in Wales. One of the main initiatives of the ASRS was to provide relief for wives and children of workers who had died while working on the railways. This ‘Wives and Orphans Fund’ had many fundraisers, and although in the early years this took the form of picnics and dances, by the 1890s and early 1900s the two leading rugby teams in Barry were playing an annual charity fundraiser match at Romilly Park. Usually taking place over the Easter weekend, large crowds were guaranteed. However, as association football became increasingly more popular in the district, so these annual charity fundraisers became more focussed around football – or at least, it was football that was now grabbing the headlines. The first recorded football match specifically in aid of the ASRS came over the Easter weekend in April 1911 when two leading local sides, Barry Island and the Pyke Street Old Boys played in front of a large holiday crowd at Romilly Park, with the formidable Island team running out 4-1 winners. At this point, the leading senior side – Barry District AFC – played at their own Jubilee Field ground located somewhere on or near the present-day Buttrills playing fields. With Barry District playing away at Mardy, the local Barry Schools Cup Semi-Finals took place and there was a large ‘gate’ in aid of the ASRS Widows and Orphans Fund. It’s interesting to note that the Jubilee Field ground had an upgrade in 1911-12 when a roof was installed on the stand. It was the ‘Butts’, but evidently not as we know it today. The following season, 1911-12, saw the birth of the ASRS Cup competition as a formal competition, and presumably the physical cup itself dates from this period, although these needs verifying. Barry had been granted the honour of hosting the ASRS Annual General Meeting in 1911, so presumably the formalised cup competition was a spin-off of that honour. The first recorded teams taking part in the 1st Round of the competition were: St. Mary’s (Barry), Barry District Juniors, Bethel Baptists, Barry Woodvilles, Rhoose United, Southerndown, Rhoose District, Cowbridge United, Cowbridge Scouts, Grange United, Cadoxton Baptists, Cardiff University Settlement, Pyke Street Old Boys, and the Barry Lyndons. There was also a new team created, the Barry ASRS FC, but little is known of this outfit, and I believe it became defunct pretty soon after its formation. The very first round of the new ASRS Charity Cup competition took place on Saturday 13 January 1912 when Pyke Street Old Boys swamped Cowbridge United 5-0. The second round, later in the month, saw a local powerhouse, Barry West End who were based at Romilly Park, beat Talygarn 8-0. Barry West End then set off for a friendly against Bolton Wanderers Reserves on Easter Monday, 1912, – and it was out of this match that William ‘Billy’ Jennings got signed up for Bolton Wanderers. One minute playing in the ASRS Cup at Romilly Park, the next minute playing in front of 200,000 at the FA Cup ‘White Horse Final’ for Bolton Wanderers and numerous Welsh caps, becoming the first Barry-born player to represent Wales. Played at the Buttrills, for an admission fee of fourpence, the first ASRS Cup Final was between Bethel Baptists (with Billy Jennings) and Barry Island. 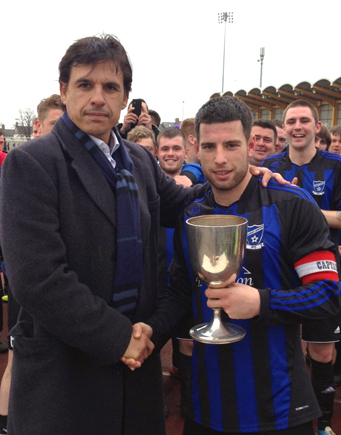 The Islanders triumphed once again – despite the ‘brilliant display’ of Jennings, and the cup was presented to the Barry Island captain, Eli Lewis, by Councillor C.B. Griffiths. ‘CB’ of course later becoming the first Chairman of Barry Town. It was later reported that the new cup competition had raised over £20 for the ASRS Widows and Orphans Fund which is over £1,700 in today’s money – a decent amount of money even now. The 1912-13 ASRS Cup Final, also played at the Buttrills, was between Barry West End and Pyke Street Old Boys, with Barry West End being triumphant by 2-1. And so on to the 1913-14 season, and the first season the ASRS Cup Final was to be played at the new Jenner Park stadium. The opening game of the competition came at Jenner Park when the Barry ‘A’ side took on the more experienced Barry West End in front of a ‘goodly number of spectators’ which were treated to a ‘spirited encounter’. Barry ‘A’ rushed into a 2-0 lead before being pegged back 2-2 by half-time. The game ended 2-2. The replay, at Romilly Park garnered ‘tremendous local interest’ and this time West End went into a 2-0 lead, before three second half goals meant Barry ‘A’ would meet Wenvoe in the next round. Charlie Probert, a future Barry Town pro, put the West End ahead, and Bunford made it 2-0 after some incredible pressure on the Barry A goal. So, at 2-0 at half time, it was all going the West End way. However, the 2nd half saw the Jenner Park outfit play their best football of the season with Thomas scoring two goals in quick succession to level the tie at 2-2. Farmer, the scorer of the two goals in the previous round, popped up to score the winning third goal for the Barry ‘A’ in extra time. A week later Barry West End FC, based at Trought’s Restaurant, decided to make a presentation for Billy Jennings who had signed for Bolton Wanderers the season before from the West End and had just received the call-up to the Wales squad. Barry ‘A’ met Wenvoe in the next round and the 3-0 victory (with goals from Crockett and Billy Saunders) was straight forward enough, as was the 4-1 win over Barry Roxburgh in the ASRS Cup Semi Final, and this set them on course to a mouth-watering ASRS Cup Final clash with the mighty Cadoxton Old Boys. The Cadoxton Old Boys had strolled past the Barry Lindens 7-1 at their Semi Final at Jenner Park on March 17, 1914. Future Barry and Swansea star ‘Tich’ Evans scoring no less than 5 of the goals. Keen rivalry existed between these sides and when they met on Saturday in connection with the final of the A.S.R.S. Cup there was a large attendance. The proceeds of these games are devoted to the widows and orphans of the railwaymen. The teams have met previously in other competitions and are about evenly matched. In the first half, Farmer opened the scoring, and from a penalty Green also scored. Cadoxton tried hard to decrease the lead in the second half and Nin Jones, one of their forwards, landed a fine goal. After the match Councillor Felix-Williams presented the cup to the winning side in the presence of a large crowd, who congregated in front of the band stand. As far as I am aware this is the first, and last, mention of a ‘band stand’ at Jenner Park. Romilly Park had one, and Victoria Park still has one, but hearing that there was one at Jenner Park in 1914 comes as something of a surprise. Whether or not this was constructed specifically for the cup finals at Jenner Park that season I guess we may never know. Either way, the band stand is not mentioned again in any later report that I’ve seen. Besides which, with the nation plunged into World War months later, there was little requirement for one. The season was rounded off by the Bevan Shield Final between Cadoxton Victorias and Roath Park United, both Cardiff League sides (Cadoxton winning 3-1), and the season was concluded with a fund-raiser between Barry and the ‘Pick of the District’ in aid of the Barry Horticultural Society. The District side being a mix of players from the Barry ‘A’ side (P.John, Billy Saunders, J.Watson), Barry Island (E.McWade, A.Laily), Cadoxton Old Boys (A.Snook, ‘Tich’ Evans and E.Jones) and Barry West End (Charlie Probert, C.Moore, and S.Lathy). Due to the worsening crisis on the continent, it appears that the ASRS Cup competition was back to simply being a one-off fundraiser. Again held at Jenner Park, over the Easter weekend, the match was a one-sided affair in which the 4th King’s (Shropshire) Light Infantry defeated the 12th Service Battalion Welsh Regiment 11-0. The brief mention of the match in the press listed the game as being “in aid of the N.U.R. widows’ and orphans’ fund”. The Amalgamated Society of Railway Servants had merged with the United Pointsmen and Signalmen’s Society to form the National Union of Railwaymen in 1913. The competition next came back in Easter 1916 when, played at Jenner Park once again, the Glamorgan Fortress Royal Engineers defeated the 3rd Welch Regiment 3-1. The Royal Engineers featured future Barry player-manager Syd Beaumont in their ranks. Similar to the 1915 match, this appears to have been a one-off match rather than any kind of organised competition. ASRS Cup Final report from the Barry Dock News, May 3, 1918. The 1918-19 season was a very interesting one in as much as although no proper league system had yet to be set up to accommodate clubs back to their pre-War positions, the Barry players and staff all re-assembled as Barry District AFC. Those who know their local football history are aware that the District name dated from the 1890s before moving into the Southern League as Barry AFC ‘The Linnets’. competitive matches as such. And it was as Barry District that the club won the 1919 ASRS Cup Final at Jenner Park, against the competition’s first-ever Cardiff opponents, Splott Amateurs, winning 2-1. Splott Amateurs would eventually win the cup in 1919-20 and again in 1920-21. Throughout the rest of the 1920s the competition carried on apace, although some of the ASRS Cup Finals were returned to Romilly Park. This was probably due to the pressures placed on Jenner Park with the onset of the Barry & District League and its own cup competitions such as the Barry Cup, Dockers Cup and Harris Cup. The competition had disappeared by 1934 with Cadoxton Athletic claiming the cup in 1932-33. The competition didn’t return again until the 1957-58 season when the all-powerful Cadoxton Albions picked up three of the following four victories in the ASRS Cup. The ASRS Cup competition was briefly brought back for the 1932-33 season after a couple of seasons away, but would not return to competition again until the 1950s. Since that time, however, and some 100 years after the union’s name fell into disuse, the ASRS Cup is still a trophy being played for in local football, and is a genuine relic of a by-gone era from Barry’s industrial past. Although football in Barry is almost as old as the docks themselves, local amateur teams had the choice of competing in the South Wales League or the Cardiff and District League by the turn of the century. The Barry Milltonians v Barry Dock match came to a rather abrupt conclusion just before half-time. Through an oversight, permission had not been asked to play on the ground, and in the middle of the game the owner of the field put in a rather unwelcome appearance, and ordered referee, players, umpires, and spectators off the ground. The Barry Dock XI had scored once to their opponents nil, when they had to leave the game unfinished. It wasn’t until the 1907-08 season that Barry would have a league of its own. Meetings at the Clarence Temperance Hotel in Holton Road, which had initially been held to organise a charity cup competition to involve clubs from Barry and the Vale, but soon the idea developed into the creation of a new league for the District. About 20 clubs had been represented, and it was decided that eight of these were to be accepted into Division One of the new league. Teams in that first season 100 years ago included Barry District Reserves, Barry Island, Holton United, Cogan Old Boys, Barry West End, Gladstone Villa, Barry Railway Offices and Cadoxton. Division Two of the new league would feature other Barry teams as well as Vale teams such as Cowbridge, St. Athan and Penarth, but it was hoped new teams would be formed in order to enter the new competition. A Third Division, formed with the assistance of local school teachers, would consist of teams of schoolboys under the age of sixteen, schoolboy football proving extremely popular at the time. Unfortunately, with clubs fielding teams in both the Barry and Cardiff leagues, the Cardiff League was always going to be the senior partner and Barry sides would prioritise towards the Cardiff League. By the start of the 1909-10 season it was reported that the Barry & District League was in financial difficulty, and details of games in the local press after this point are few and far between, possibly meaning the league had unfortunately folded soon after. The intervention of the Great War would mean any thought of re-creating a football league for Barry would have to wait. However, after previously introducing the YMCA club to baseball as well as re-forming the Barry YMCA Football Club, the YMCA’s Secretary Mr. A. C. Morrish was the energetic personality behind the reformation of an association football league for Barry and the district. On 24 March 1920 at the YMCA Hall in Newlands Street, Barry Dock (now flats), 37 local football clubs pledged their support for the new football league. By July 1920 this number had risen to some 44 clubs and the plan was to have 4 divisions of teams, with Division 4 being for ex-schoolboys under the age of 17. Clubs were not allowed to compete in the Cardiff & District League, but to open up the Barry competition to other organisations clubs within 15 miles of Barry could sign up for the new league. By August 1920 a friendly match was organised at Jenner Park between two teams made up of players from the more prominent clubs in the district. Off the field, the organisation of the league was progressing well and it was reported that a new cup was given by the tradesman of the town to the Barry & District AFL and would be known as the Barry Cup and was open to clubs within a radius of 15 miles of ‘equal standing’. Barry Cup Runners-up medals were presented by the Barry AFC Supporters’ Club. 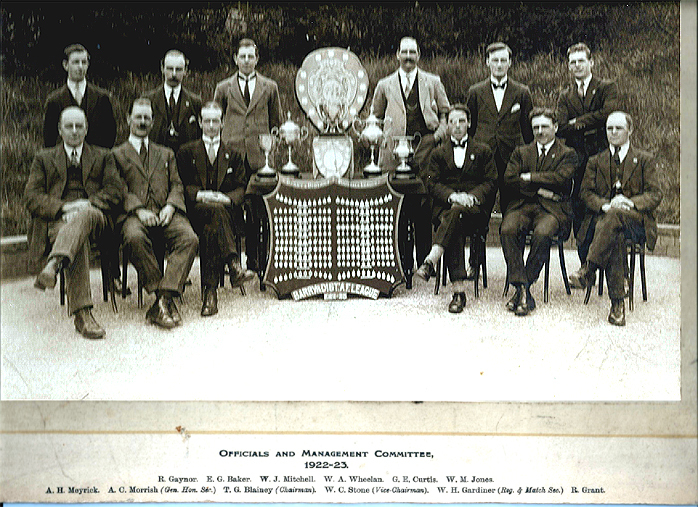 A further cup, the Harris Cup, was donated to the League by Mr W. Harris of the Central Billiard Hall, and this would later become known as the Harris Junior Cup, or simply the Junior Cup. The Dockers’ Cup would come along a few months later, and would be played for by teams outside of Division One, but was also open to teams of ‘equal standing’ within a radius of 15 miles. Another cup competition was already well known to local clubs. The ASRS Cup dates back to 1911 when a football fund-raiser for the Orphan’s Fund of the Amalgamated Society of Railway Servicemen (ASRS) took place between Barry Island and Pyke Street Old Boys, two of the best teams in the district, at Romilly Park over the Easter weekend. This event would prove such a success that the following season a new ASRS Cup knock-out competition was created. The very first winners of the ASRS Cup as we know it today was in 1911-12 when Barry Island defeated Bethel Baptists 2-1. 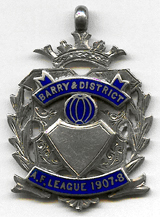 The first full season of the new Barry and District League in 1920-21 saw four divisions divided up between 38 clubs. A Division One of six clubs was won by Barry Centrals, with Cadoxton Old Boys as runners-up. Division Two was won by the Barry Centrals Reserves team with Barry YMCA Athletic as runners-up. Division Three was won by Barry YMCA Seconds with Barry Ninians as runners-up. Finally, Division Four, which acted as the Junior Division was won by Tynewydd Road Congregationals, with St. Paul’s as runners-up. As far as the Cup competitions went, the Harris (Junior) Cup was won by Barry Island, the Dockers’ Cup was won by Atlantic Juniors, while the Barry Cup was won by Cadoxton Old Boys who had beaten Barry YMCA in the final at Jenner Park. Unfortunately, it later transpired that both clubs had fielded an ineligible player and so the very first Barry Cup Final was forced to be replayed at the start of the 1921-22 season. Cadoxton Old Boys would win the replay 3-0 at Jenner Park. 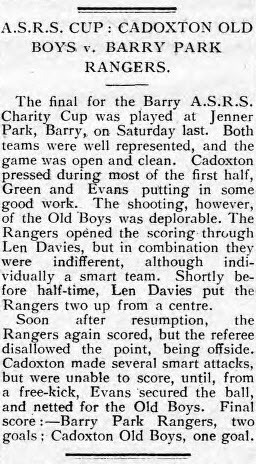 Interestingly enough, Cadoxton (who were now known as simply Cadoxton AFC) would win the Barry Cup at the end of that season also, and so go down as being the only club to be presented with the Barry Cup twice in one season. They would also be the first team to record a league and cup ‘double’ and also had the distinction of three of their players helping out the town’s senior team, Barry AFC, in their Welsh League campaign. The 1925-26 season saw the first Vale team win the League when Sully Athletic claimed the title, as well as lifting the Barry Cup. The League had plans of expanding its divisions to include a Wednesday Division, a Sunday School Division, as well as merging with the Bonvilston & District League. However, with the economics of the town on the downturn the Barry and District AFL would soon be in financial difficulty. Popular clubs, unable to afford the fees for affiliation to the league, would withdraw or in most cases just fold. This lessened the quality of the league as a whole and by the 1930s the league was almost constantly fighting against adversity. The League reached crisis point prior to the 1932-33 season whereby so few clubs had applied for Division One status, an expanded Division Two was formed and the Division One was suspended. Fortunately, this lasted only the one season, but throughout the 1930s the amount of Barry teams in the League would gradually decline and the amount of Vale teams would increase, and this was also the period where Abercrete Athletic, from Rhoose, would rise to prominence winning Barry Cups, Dockers’ Cups and League titles along the way. There was brief talk of merger between the Barry and Cardiff League, which was also struggling, but this would come to nothing. The ASRS Cup fell from favour during the Depression years, and after briefly being claimed by Cadoxton Athletic in 1932-33, the Cup was not competed for until the 1957-58 season when Cadoxton Albion would go on and win it for four consecutive years. With the League suspending activities throughout the Second World War, league football was not resumed until the 1947-48 season when the Barry Town Supporters’ Club gave a new Barry Town Supporters’ Cup to the League for competition. The 1950s was marked by the rivalry between some great teams like Cadoxton Albion, Borough Rovers, Trebeferad, and Sea View Labour. The 1960s saw the emergence of Colcot Stars who did a Treble twice in four seasons (League, Barry Cup and ASRS Cup, and League, Barry Cup and Supporters Cup respectively), and Barry Saints deserve a mention too for their 1967-68 Quadruple of League, Barry Cup, ASRS Cup, and Supporters’ Cup. The team was later adopted wholesale as the Barry Town AFC Welsh League side. With Butlin’s coming to Barry Island, and with local sport in mind, a special Butlin Trophy was given to the league to be competed for by junior sides. The trophy is still competed for today as the Junior Cup. September 4, 1920: First weekend of league matches take place. November 6, 1920: First ever Barry Cup fixture is played (Barry Centrals 3-3 Barry Bohemians), and takes place at Jenner Park. April 1, 1921: The senior club, Barry AFC, recognises the value in the local league and field several Barry League players in their Welsh League side. One of them, John ‘Jackie’ Gardner, later establishes a lengthy career with the Linnets. Gardner was inducted into the Barry Town Hall of Fame in 2013. April 21, 1921: A Division One Championship decider is held at Jenner Park between the Barry Centrals and Cadoxton Old Boys. Centrals win 1-0 and become the league’s first senior division winners. June 24, 1921: The Barry Cup Final result is declared invalid and has to be replayed as both teams fielded ineligible players. The replayed Final takes place in September of the following season. Therefore the 1921-22 season is unique in that it had TWO Barry Cup Finals.